I don’t suppose I would be Chairman of SENRUG if I didn’t honestly believe rail travel is superior to competing forms of transport. This isn’t just an ideological stance for me. I won’t use rail if it is significantly more expensive than other alternatives. But I’ve found, once you start thinking "train", it often proves to be the cheapest option, as well as arguably the most pleasant. This is certainly the case for Nîmes, in the south of France, where my daughter lives. Yes there is a low cost airline that goes there. But we can not get to Luton Airport in time for the daily 11.15 am flight (with luggage you have to check-in 2 hours in advance) and so once you add on to the air fares the cost of a London hotel, plus of course the travel to and from London and London to Luton, I find that travelling by train, although it takes all day, is cheaper. And of course the journey is completed in one day, giving me that extra day in the sun. The train journey really begins 2 months before your intended date of travel, when the European rail tickets become available for sale. In the UK, tickets are generally available up to 3 months before, but on the continent it is only 2 months. Which means, if you are planning a 2 week holiday, you can only book 6 weeks before your travel, as with Eurostar and European tickets you need to specify the return train to get the cheaper tickets. And this is the first point the rail companies need to get the heads round if they really want to see the European travel market grow. We, the humble passengers, generally like to book up our holidays considerably more than 6 weeks in advance. We daren’t book the hotels until we know for sure the rail travel is available at a reasonable price, but with just 6 weeks to go it could easily be the case the hotels are fully booked. Tickets can be booked online at either Eurostar or Rail Europe. Even my favourite train booking website www.nationalexpresseastcoast.co.uk (who don’t charge fees for using credit cards or posting tickets out) has a link allowing you to book European tickets (though difficult to find as you must look under “special offers”). [Webmaster’s note: National Express no longer operate the East Coast franchise and have been replaced by www.eastcoast.co.uk]. But actually, booking online is not that easy. There seems to be no way of asking the system to consider slower journeys via Lille if the same outbound Eurostar offers a faster (but much more difficult) connection via Paris. Also, the online system does not allow you to specify a different Newcastle – London service, (for instance if you want a bit more time at Kings Cross), though if you book by phone all this can be arranged – though be warned - the call lasted over 20 minutes which even to a local rate 08457 number can still be expensive. If only National Express could provide the “real” phone number for their telesales department; the number would be part of my free calls package, but sadly 08457 and all non-geographic numbers are excluded. For the return portion, as tickets had only just been released for sale, the helpful operator was able to find an all-inclusive ticket (Nîmes to Newcastle) for just £66. A bargain at any price, though true this was for the less favourable route via Paris. Ok, so call it £68 by the time you add in the Paris RER fare between Gare de Lyon and Gare de Nord, which is not included. Another point for our friends at SNCF to look at. (Cross London rail travel booked on a through ticket does include the underground or Thameslink section). But for the outgoing leg, the £66 fare was already sold out. This was because fares had already been on sale for some days though I had not been able to book until 2 months before my return date. The next cheapest fare was the almost double at £120 although this was for my preferred route via Lille. But the helpful National Express operator pointed out that for an additional £1 I could obtain a Leisure Select ticket (for the Eurostar and SNCF legs – including a first class seat and complimentary lunch and drinks on Eurostar) and that seemed no contest. So, £121 out and £66 back making £187 in total, still very reasonable compared to the air fare, London hotel and travel costs to the airport. Booking a through ticket from Newcastle to Nîmes is most important (as opposed to separate tickets to London and then for Eurostar / SNCF). Your UK rail ticket is marked to “London CIV”. What the letters stand for I do not know, but it means that if for any reason your train arrives late in to London, you are entitled to just hop on the next Eurostar and then SNCF train without paying a hefty fine for changing the booked train. Same applies if you are late arriving in to St Pancras on your return journey. With that all important CIV on your ticket, you can just get the next National Express train out of Kings Cross and smile sweetly when the Conductor comes round. However, as we shall see, this is not a rule I needed to put to the test. Ideally, I would have liked to have extended this logic a bit further and booked my tickets to and from Cramlington, my local station. This all proved too much for the ticketing system and would have pushed my total fare up by over £100. Far better just to buy the local tickets as extras on the day at £3.50 single each way. So come 18th July, my date of travel, I stood rather anxiously at Cramlington station to wait for the 08.40 train to Newcastle. Unfortunately, despite SENRUG’s campaigning, Cramlington still has no public information system, no help point and absolutely no way of finding out whether the train is going to arrive on schedule. Yes, you can text train tracker, but if the train has not yet left Morpeth, it’s starting point, all you will receive back for your £1 mobile phone fee is a text saying “no information available”. Knowing that my super through ticket only started at Newcastle, and if for any reason I didn’t get there in time for the 09.30 London train I would be in deep trouble, I was naturally a bit concerned. My long-suffering wife was commandeered to wait with the car in order to drive at break neck speed into the City if for any reason the train did not appear. Even that would have been tight; if for instance I had allowed up to 5 minutes after the scheduled time, leaving Cramlington at 08.45 by car to get to Newcastle Central Station for 09.30 would have been interesting. It is for reasons like this that Customer Information Systems are needed at all stations. But I needn’t have worried. On the dot of 08.39, the train came in to view round the curve. It was even Northern Rail’s special Seattle-Carlisle liveried 156 unit – exactly the same train as had been provided a month or so earlier for SENRUG’s hugely successful charter round the Ashington Blyth & Tyne line (which we are campaigning to re-open to regular passenger traffic), and during the short and uneventful journey in to Newcastle I was able to reflect on the tremendous co-operation the team at Northern Rail had provided to make our event such a complete success. Arriving at Newcastle on schedule at 08.53, I had time to wander around the station and pick up a magazine for the journey before heading to platform 3 where the 09.30 arrived bang on time. I quickly found my reserved seat and settled down for the journey to Kings Cross where we arrived fully on schedule at 12.42. Transferring from Kings Cross to St Pancras next door is really very easy. The two stations face each other across St Pancras Road, and the walk is not really much further than you might have to walk between different platforms in a single station. It’s worth noting you can reach the First Capital Connect platforms for Croydon, Gatwick Airport and Brighton with the same ease. St Pancras station was at the time not fully finished, and Kings Cross is undergoing redevelopment, so I did wonder if it is ultimately planned to link the connection across St Pancras Road with a level access subway or at least a covered walkway. A yet to be opened lift and escalator on the St Pancras side looked hopeful, though subsequent visits have revealed this is to give access to the Kent Express “Javelin” service. The absence of a walkway sheltered from the elements is surely a major design failing in the planning of what is a not quite integrated London terminus. Just my luck, it was pouring with rain, and not having considered an umbrella as essential for the South of France I was rather bedraggled by the time I got to my Eurostar seat. My itinerary allowed me just over an hour for the one minute walk from Kings Cross to St Pancras, so I thought I would be able to relax and admire the much acclaimed gothic architecture of the fully renovated St Pancras Station. Not so. Eurostar’s procedures are to keep passengers in an underground holding lounge and only to allow access to the platforms 15 minutes before departure. There are an awful lot of passengers on a 16 car Eurostar train, and getting them all up the ramp, on to the platforms and boarded in 15 minutes in my view was ambitious. There was certainly no time to admire the scenery, and in the circumstances it was not surprising we were 3 or 4 minutes later than the scheduled 14.04 in gliding out of St Pancras en route to the Channel Tunnel. This was to be the nicest part of my journey since being in Leisure Select, in due course I was served with a complimentary champagne and lunch. The first part of the journey, through Essex, is mainly tunnels. We surface briefly once having crossed the Thames to whiz through the yet to be opened Ebbsfleet Station. Long ago, in another life when I lived in South East London, I campaigned furiously to get the authorities to site Ebbsfleet station where it crosses the South Eastern lines just 400 yards further down the track and integrate it with the domestic station at Northfleet, but no avail. Eurostar just could not accept that people might want to start their journeys by rail, preferring to believe Londoners would much rather start our holidays with a drive round the M25 and then pay exorbitantly to leave their car at the Ebbsfleet car park for a week. Shortly after Ebbsfleet is Ashford, well connected in to the domestic rail network, but alas, now to become a ghost station as far as European services are concerned, as Eurostar are transferring almost all their stops to Ebbsfleet. Scarcely time to blink once past Ashford and we are in to the Chunnel itself. When Eurostar first started there used to be a proud tannoy announcement when the train entered the tunnnel, with announcements changing from English first to French first once you passed the half-way mark. Nowadays it seems no fuss is made at all, perhaps the authorities want us to realise that cross border rail travel is really no big deal. With lunch out of the way, the Eurostar service team were still on their way round with the complimentary wine just 10 minutes before Lille, raising the risk I would miss out. The staff seemed to work on the assumption everyone continues on to Paris or Brussels and seemed genuinely surprised when I started to gather my belongings together to alight at Lille Europe. In fact, as events will reveal, quite a few Brits have discovered the Lille interchange is the easiest way of getting to the South of France. Maybe none of the others travel Leisure Select as I was certainly the only person to leave the train in from my coach as we arrived in Lille as scheduled at 16.24, having recovered those lost minutes at St Pancras en route. 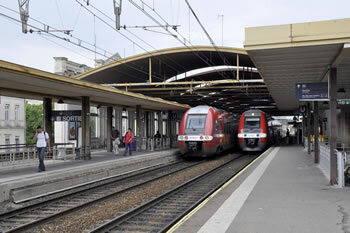 Now I have to say I have travelled to the south of France via Lille a number of times before, and each time the TGV Sud leaves from either the same platform or the other side of the platform on which the Eurostar arrives. The interchange is so simple Just stay where you are and wait for the TGV. But on this occasion, it seemed the French wanted to go out of their way to make things difficult. Despite there only being 34 minutes connection between the Eurostar and the TGV, the platform for the TGV was not advertised. Passengers were told to go to the station concourse for further information. And here, 20 minutes later, we were directed back down the lift to the same platform and on to the TGV. Settling down now for the four and a half hour run to Nîmes, I had time to consider what the difference is between the English and French journey system. Somehow in France it seemed more relaxed, and yet it took me some time to work out why. Finally, the penny dropped. It was so quiet. No constant announcements about what tickets are not valid. We are not repeatedly told what is for sale in the buffet car. It doesn’t change from week to week so I guess the French reckon you either just know, or will go along and find out. Neither are we continually reminded to take our luggage with us when we leave. The French seem to realise that’s obvious. And the quiet coach rule is actually enforced. A man near to me chatting in to his mobile phone was sternly reprimanded by the passing conductor and banished to the foyer. In fact, during the four and a half hours on the TGV, everyone seemed to sit in silence and there was just one brief announcement prior to each station. And so eventually, and exactly on time at 21.28, we arrived in Nîmes. A long journey admittedly, of almost 12 hours, but a pleasant one, and with the exception of the unavoidable Eurostar check-in formalities, very little queuing; mostly just sitting down and watching the countryside rush past. 6 short days later and is time to return. It’s an earlier start, and I need to be on the 07.50 out of Nîmes. The first thing to note about the return journey is that in France it is necessary to put your tickets through a machine and “compost” them, before boarding your train. In reality the machine is stamping the date, time and station of boarding on the ticket to prevent it being re-used. Being caught on the train with an uncomposted ticket will result in the same penalties as being found with no ticket at all. So what a pity no-one thinks to include a leaflet with the tickets advising British travellers of this. A note could easily be inserted on the Eurostar wallet the tickets arrived in. With my tickets safely “composted” I’m on the platform in good time and sure enough the TGV arrives just as expected. The journey to Paris is uneventful, and as I’m returning via Paris the TGV journey is shorter than the TGV on the way out from Lille, being just under 3 hours. Arrival at Gare de Lyons is on schedule at 10.41, giving me an hour and a half to get across Paris to Gare de Nord. Sounds simple, and after all it’s only 2 stops on the RER so it should be easy. But don’t confuse 2 stops on the RER with 2 stops on the Metro. RER is a through Paris limited stop suburban system, a bit similar to Thameslink or our long awaited CrossRail. But the stops are not nearly as close together as they are on these systems, so the 2 stops is more like going from Baker Street to Wembley Park on London’s Metropolitan line, a good 20 minute journey. The second thing is that in France, you find your way around the network by knowing the final station for the line you need. So I knew I was looking for “RER Line D Destination Orry-la-Ville-Coye”. Easy, until I got to the platforms themselves when the system seemed to change in favour of using the next station. I hadn’t bothered to remember the intermediate station between Gare de Lyon and Gare de Nord so didn’t know whether I was heading for Châtelet-Les-Halles or Maisons-Alfort-Alfortville (it’s the former in case you try this yourself). Two platforms confronted me. I chose one, but seeing nothing to confirm it was the right one, I wisely let the first train go. Time to try out my French, and put to the test the things we had been learning at my weekly adult education class at King Edward School in Morpeth. “Pour aller à la Gare de Nord?” I boldly asked a fellow traveller. To my astonishment and immense pride, not only did he readily understand me, but more to the point, I understood his reply as well. “Le quai en face” he advised, meaning back up the stairs and down again to the opposite platform. So, safely on the right train, but thinking the one and a half hour connection time doesn’t really allow for any mistakes on the RER (remember it’s a 30 minute check-in once at Gare de Nord), I arrived at Gare de Nord with just 45 minutes to go. And this is where I made the mistake of trying to put to the test the level access walking route from the RER to Eurostar. Ignoring an escalator signposted “Eurostar”, I pulled my wheely suitcase along the length of the platform until I found a lift. This took me to a concourse but once here there were no further directions to Eurostar. It just wasn’t possible to retrace my steps on the upper level to where the escalator led to. Sensing I still needed to go up, I eventually found another lift. This took me to street level but now I found myself at the back of the bus station. Unlike my outward journey, it wasn’t raining so I pulled my suitcase along through the bus bays, eventually re-entering Gare de Nord from the outside. Eurostar check-in was clearly signposted, but again only via an escalator route. There was in fact a lift but I had to hunt around for it. Then, through a very congested Eurostar check-in area and once again, held in a cramped lounge until just 10 minutes before the Eurostar departure time when we were given access to the platform. Leaving Gare de Nord at 12.13, the return Eurostar journey was uneventful, and in no time at all we were passing through the Kent countryside and back in to St Pancras on schedule at 13.28, having put my watch back an hour for the time difference. An hour now to make my connection to the National Express train at neighbouring Kings Cross, which I did with ease, noting that it’s when you arrive at St Pancras (rather than when you depart) you have the opportunity to admire the station in its renovated splendour. Time too to pop into Smith’s for a sandwich and my Railway Magazine (and here’s a trick – the Smith’s at St Pancras is a lot less crowded than the one at next door King’s Cross) and then try to find a seat on the Kings Cross concourse whilst waiting for the platform for the 14.30 departure to be announced. Returning on the National Express service, all went well until just before York, where the train was held for 5 minutes outside the station. But the confidant conductor assured us we would make the time up before Newcastle. Unfortunately the 5 minutes delay became 6, and then as the train proceeded at less than full speed, it became 10. Suddenly I realised there was a danger the 20 minute connection time at Newcastle for my Northern Rail service back to Cramlington would be insufficient. So, suitcase ready, and stand by the door poised to run as the 10 minute delay moved up to 15. I should still do it, I told myself. The Northern Rail train is bound to be at platform 5 and even 5 minutes should be enough to make the change. But what about the rule which states that, as Newcastle is a staffed station, I must buy my ticket for the Northern Rail train before I get on board? That’s fine when there is a 20 minute connection, but when your incoming National Express train is 18 minutes late, and given I actually wanted to buy a through ticket but was quoted an extra £100 for a simple £3.50 extension, will our Northern Rail colleagues show discretion? Serious panic now as we stop at the signal on the King Edward Bridge. This is looking very tight. Why can’t the platform for connecting services be advertised on board the incoming train or at least could the conductor make an announcement – he must be aware that the 18-minute delay has put some connections in jeopardy? And so finally in to platform 2, first off the train, and fighting the crowds to get over the bridge and arrive, breathless, at platform 5 to see the Northern Train pull out, admittedly on time, but not what I would call an integrated railway? So, in the final hurdle of this epic journey, a connection is missed. Back now to the main concourse for a coffee (and to purchase that all important ticket) and the 40 minute wait for the next train. Still, if it had been in the middle of the day the wait would have been a full hour. And that explains why it was not possible to get the through ticket to Nîmes from Cramlington, since had it all been on one ticket, arriving at Cramlington an hour late would have required our good friends at National Express to give compensation for the entire journey under the Delay Repay scheme. As it was, the ticket was only to Newcastle and the arrival there was only 18 minutes late (17.44 instead of 17.26). I guess it is because the risk of compensation increases every time a connection is bolted on the cheaper tickets are generally only sold for travel between Inter-City stations. Commercial reality yes, but common sense no, and of course in forcing passengers to buy connecting tickets separately in this way the train companies are losing invaluable data on the real start and finish points of customers’ journeys. Plenty to think about then as I wait for the 18.28 Northern Rail train that delivers me safely back to Cramlington at 18.41, the return journey even allowing for the missed connection being an impressive 10 hours 50 minutes. Note: Eurostar are currently operating an emergency timetable following the fire in September 2008 and there will be some variations to the above schedule if travelling before full service is resumed.